Jim Doyle had it all set. Prior to the Knights of Columbus Four-Mile Relays on Saturday, the Bishop Hendricken coach had his No. 1 team leading off with multiple all-stater Colin Tierney. The plan was to have the senior distance ace establish a good lead at the beginning and force the other squads to play catch-up against his Hawks. But Tierney and his teammates figured a different order might make more sense, an order that would use the Columbia-bound runner as the anchor. After staking their case, Doyle decided to let his team make the decision. There was no blame on this particular day. 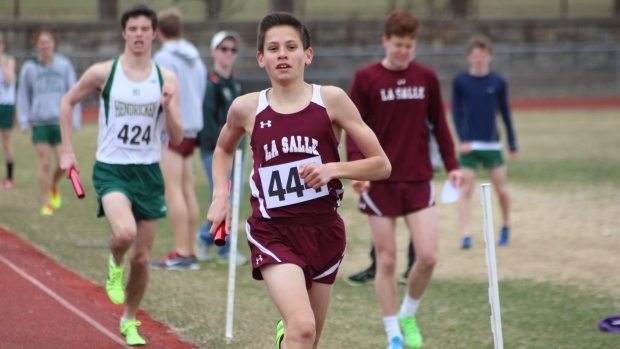 With an explosive 4:23 leg, Tierney made up a more than nine-second gap over front-running La Salle Academy to lead his team to victory in the Division I race. The quartet of sophomore Avery Ingegneri, junior Grant Gauthier and junior Michael Potter finished with a combined effort of 18 minutes, 22.87 seconds. La Salle secured second at 18:25.96. The Rams were anchored by freshman standout D.J. Principe, who ran a fast 4:35 split. 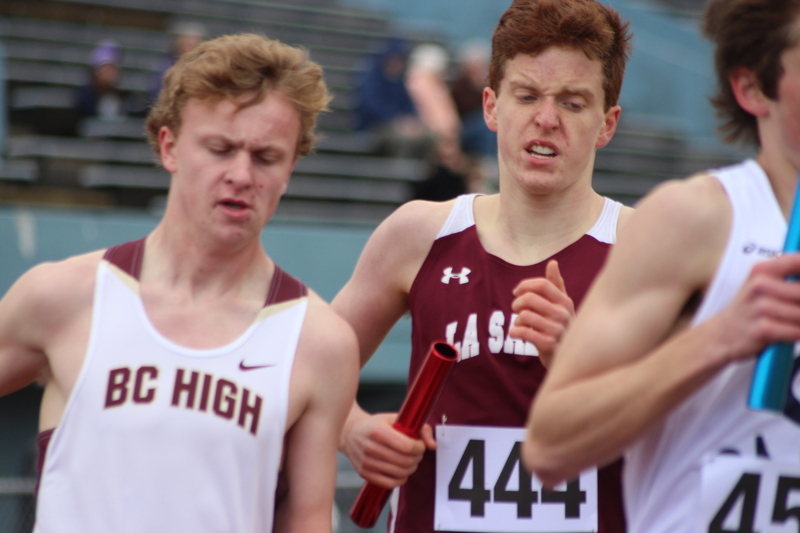 Tierney patiently gained ground once he got the baton and passed Principe with about 250 meters remaining. The times posted by the two powerhouses were the fastest of the afternoon. In the Div. II race, Barrington won convincingly with the squad of Lucas Beldsoe, Krishnam Boniaz, Marcus Safrenek and Sam Somera timed in 20:11.90. West Warwick was a runner-up at 21:41.52. East Greenwich was an impressive winner in the Div. III race with the foursome of Garrett Scanlon, Tommy Sommer, Angelo Acker and Graham Chapski finishing at 18:40.87, the third best clocking of the day. In Div. I, La Salle was without some of its top runners, including indoor mile champion Jack Salisbury. But the Rams still had a quality foursome on the track with a legit anchor in Principe. Tierney knew what he had to do to insure a victory for the Hawks. For a season-opening meet, Tierney’s mile time is impressive to say the least. Bishop Feehan of Attleboro and La Salle dominated the girls’ Division I race, occupying nine of the top 10 placements. Feehan’s ‘A’ squad of Elizabeth Hannon, Kayte Svensen, Bryanna Harum and Cumberland resident Abbie McNulty took gold with a time of 21:30.14. La Salle’s top foursome of Caroline Falvey, Cianna Lynch, Sheridan Wilbur and Eliza Rego was second with a 21:46.18 clocking. East Greenwich snagged the No. 1 spot in Div. II with Thedia Pederson, Phoebe Osterhout, Emily Browne and Margaret McCafferey winning by nearly a minute with a time of 23:15.65. Holyoke Catholic of Massachusetts was second at 24:13.96. 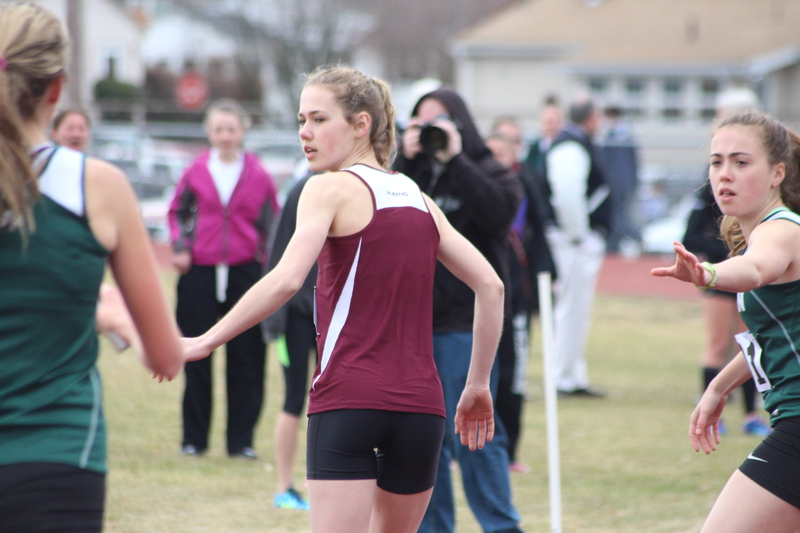 For La Salle, it was Wilbur’s first race back since a nagging hip injury sidelined her from the entire indoor track season. The junior standout, a multiple all-stater in track and cross country, ran the third leg for the Rams and was timed in 5:30. Rego anchored the Rams with a 5:13 mile and Falvey and Lynch also had solid legs. As usual, Martin has high hopes for her Rams this spring. 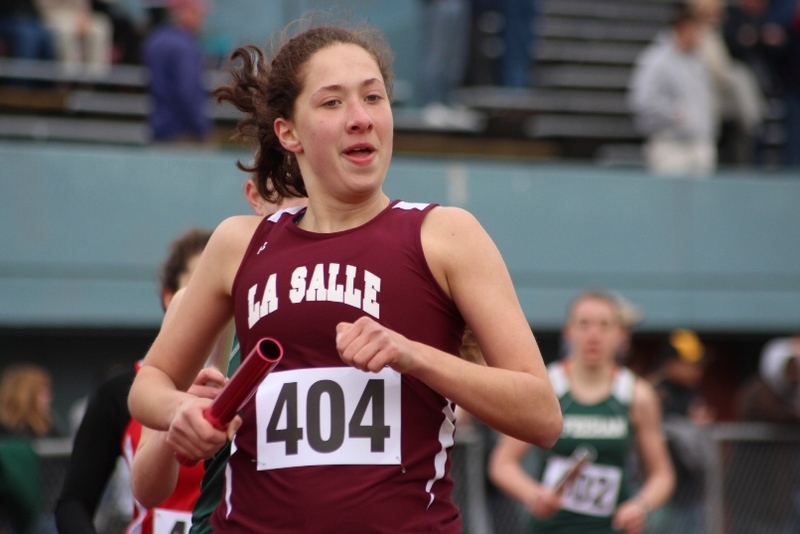 Last year, La Salle finished second to Classical at the outdoor state meet.